MONTGOMERY — Sisters Shaina and Erin-Rose Cooney walked off the Valley Central hardwood with a swift smile following a 72-43 win over Goshen Thursday night. The sister duo combined for 36 points, 13 rebounds and three blocks in a dominant performance over the Gladiators. Both scored their season-high in points. Shaina, a 5-foot-11 sophomore forward, caught fire from the opening tip, scoring six unanswered points in the first 90 seconds of the game. Those points all came on a baby-hook post-move on the left block. She finished the game shooting 8-of-9 with a game-high 19 points. 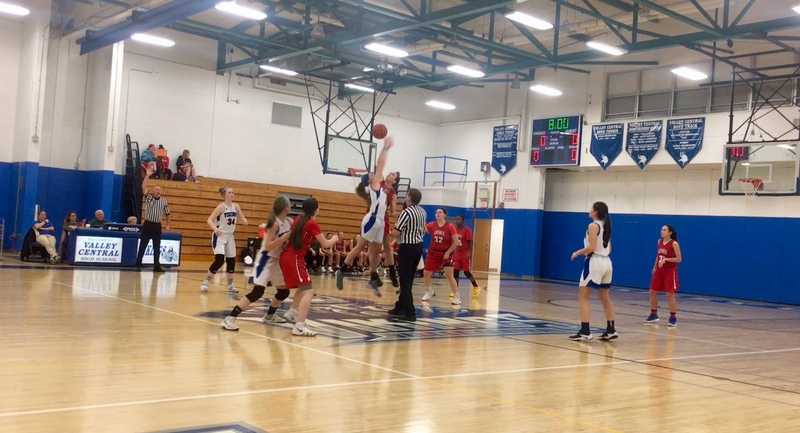 For Erin, a 5-foot-11 junior forward, she didn’t have it as easy in the first half. She was held to four points, shooting 1-for-8. Her jumpshot wasn’t falling, but the only way to get out of a shooting slump is to keep shooting. In the second half, she went 6-of-7 from the field and finished the game with 17 points. After Shaina’s six consecutive points, the Gladiators answered back with four points of their own. The Vikings responded with a 15-0 run, giving them a 21-4 lead at the end of the first quarter. They kept a steady lead after the opening quarter, with the point difference going as low as 15. The Vikings forced eight turnovers in the second half to pull away even farther. Two days after a 35-point loss to Roosevelt, Valley Central head coach Randy Axtell was happy with his team’s offensive play, but was less than thrilled with things on the defensive end. Smith, a junior for Goshen, is one of the top point guards in the section. Last season, she averaged 17 points per game and led the Gladiators in assists. Her ball-handling skills forced the Vikings to play a 2-3 zone for most of the game. Smith was held to 11 points and only made one 3-pointer. Freshman guard Madison Clark led the Gladiators in scoring with 15 points.